Anthophyllite: Mineral information, data and localities. The anthophyllite group are orthorhombic amphiboles in the magnesium-iron-manganese amphibole subgroup. The minerals in this root name group may have either Pnma or Pnmn (proto- prefixed name) space-group symmetry. The anthophyllite group's composition is defined with A(Na+K+2Ca)<0.5 apfu and C(Al+Fe3++2Ti)<1 apfu. Anthophyllite has a standard Pnma space-group symmetry and is defined with Mg as the dominant element both in the B and C positions. First described by Schumacher (1801) as a new mineral from the Kongsberg area, Norway. He named it "anthophyllum" from the Latin meaning "clove" (itself derived from the Greek άνθος for "flower" and φύλλον for "leaf" ), in allusion to its common clove-brown colour. May be easily confused with proto-anthophyllite. 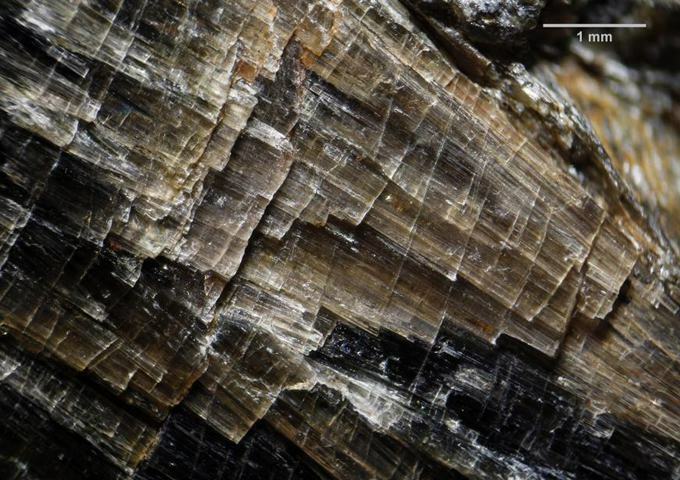 Visit gemdat.org for gemological information about Anthophyllite. Kupfferite (of Koksarov) A Cr-bearing variety of anthophyllite. Phlogopite 21 photos of Anthophyllite associated with Phlogopite on mindat.org. Chlorite Group 6 photos of Anthophyllite associated with Chlorite Group on mindat.org. Cordierite 5 photos of Anthophyllite associated with Cordierite on mindat.org. Tremolite 4 photos of Anthophyllite associated with Tremolite on mindat.org. Rutile 3 photos of Anthophyllite associated with Rutile on mindat.org. Gedrite 3 photos of Anthophyllite associated with Gedrite on mindat.org. Actinolite 3 photos of Anthophyllite associated with Actinolite on mindat.org. Anthophyllite-Gedrite Series 3 photos of Anthophyllite associated with Anthophyllite-Gedrite Series on mindat.org. Almandine 2 photos of Anthophyllite associated with Almandine on mindat.org. Vermiculite 2 photos of Anthophyllite associated with Vermiculite on mindat.org. Asbestiform habits of the mineral should be handled with care. Rabbitt, J.C. (1948) A new study of the anthophyllite series. 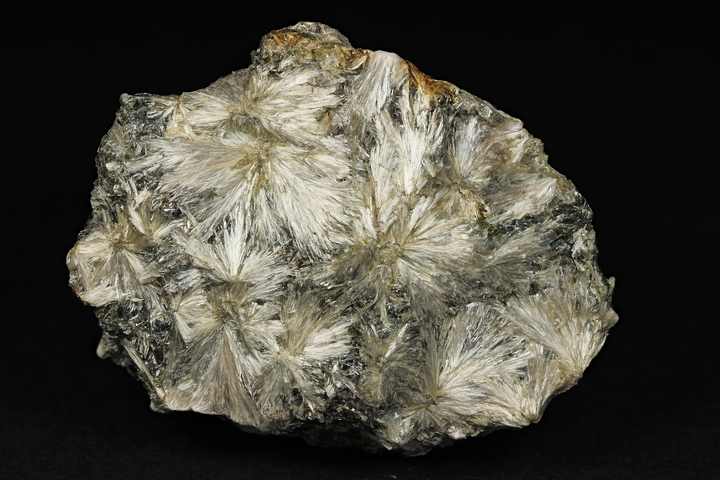 American Mineralogist: 33: 263-323. Chakraborty, K.L. (1963) Relationship of anthophyllite, cummingtonite and mangano-cummingtonite in the metamorphosed Wabush iron-formation, Labrador. The Canadian Mineralogist: 7: 738-750. Veblen, D.R. (1980) Anthophyllite asbestos: microstructure, intergrown sheet silicates, and mechanism of fiber formation. American Mineralogist: 65: 1075-1086. Walitzi, E.M., Walter, F., Ettinger, K. (1989) Verfeinerung der Kristallstruktur von Anthophyllit vom Ochsenkogel/Gleinalpe, Österreich. Zeitschrift für Kristallographie: 188: 237-244. Raade, G. (1996) Minerals originally described from Norway. Bergverksmuseets skrift: 11: 20. Ford, F.D., Skippen, G.B. (1997) Petrology of the Flinton Creek metaperidotites: enstatite - magnesite and anthophyllite - magnesite assemblages from the Grenville Province. The Canadian Mineralogist: 35: 1221-1236. Champness, P.E., Rodgers, K.A. (2000) The origin of iridescence in anthophyllite-gedrite from Simiuttat, Nuuk district, southern West Greenland. Mineralogical Magazine: 64: 885-889. Elliott-Meadows, S.R., Froese, E., Appleyard, E.C. (2000) Cordierite — anthophyllite — cummingtonite rocks from the Lar deposit, Laurie Lake, Manitoba. The Canadian Mineralogist: 38: 545-550. Ishida, K., Hawthorne, F.C. (2003) Fine structure in the infrared OH-stretching bands of holmquistite and anthophyllite. Physics and Chemistry of Minerals: 30: 330-336. Hawthorne, F.C., Oberti, R. (2006) On the classification of amphiboles. The Canadian Mineralogist: 44(1): 1-21. Schindler, M., Sokolova, E., Abdu, Y., Hawthorne, F.C., Evans, B.W., Ishida, K. (2008) The crystal chemistry of the gedrite-group amphiboles. I. Crystal structure and site populations. Mineralogical Magazine: 72: 703-730. Hawthorne, F.C., Schindler, M., Abdu, Y., Sokolova, E., Evans, B.W., Ishida, K. (2008) The crystal chemistry of the gedrite-group amphiboles. II. Stereochemistry and chemical relations. Mineralogical Magazine: 72: 731-745. Nestola, F., Pasqual, D., Welch, M.D., Oberti, R. (2012) The effects of composition upon the high-pressure behaviour of amphiboles: compression of gedrite to 7 GPa and a comparison with anthophyllite and proto-amphibole. Mineralogical Magazine: 76: 987-995. Oskierski, H. C., Dlugogorski, B. Z., & Jacobsen, G. (2013) Sequestration of atmospheric CO 2 in chrysotile mine tailings of the Woodsreef Asbestos Mine, Australia: Quantitative mineralogy, isotopic fingerprinting and carbonation rates. Chemical Geology, 358, 156-169. Warne, S.B. (1995) E.L. 8125 Coles Hill Report for Period Ending 31.10.1995. Roebuck Resources NL Technical Report No. 515. Freytag, I.B. (1994) E.L. 8164 - Rankins N.T. Review of Past Work and Exploration Opportunities, Roebuck Resources NL, Technical Report No.379. Freytag, I.B. (1994) E.L. 8164 - Rankins N.T. Review of Past Work and Exploration Opportunities, Roebuck Resources NL, Technical Report No.379. Pigott, G.F., McLennan, R.M. (1984) Exploration Licence 4420 - Sliding Rock Well. Annual Report to the Northern Territory Department of Mines and Energy for the period ending 18th October 1984, Australian Anglo American Limited. Liu, S.F. et al (2002), Geology of the Sir Samuel 1:250 000 Sheet Area Western Australia, Geoscience Australia, Commonwealth of Australia, p47, Record, 2002. Econ Geol (1988) 83:524-536; Zoja Vukmanovic (2013) Microstructural Characterization of Sulphide and Oxide Minerals in Magmatic Sulphide ores. PhD Thesis University of Western Australia. Database „Minerale NÖ“ (A. Thinschmidt and co-workers); Kolitsch, U. (2014): 1886) Dravit, Phlogopit und Tremolit von Rastbach bei Gföhl, Waldviertel, Niederösterreich. Pp. 120-121 in Niedermayr, G. et al. (2014): Neue Mineralfunde aus Österreich LXIII. Carinthia II, 204./124., 65-146. GÖTZINGER, Michael A. (1987a): Mineralogy and Genesis of Vermiculite in Serpentinites of the Bohemian Massif in Austria.- Miner. Petr., 36/2, 93-110, Wien - New York; Götzinger, M. A. (1987): Vermiculitvorkommen der Böhmischen Masse in Österreich und ihre Entstehung. Mitt. Österr. Mineral. Ges., 132, 135-156. EXEL, Reinhard (1993): Die Mineralien und Erzlagerstätten Österreichs.- 447 S., Wien (Eigenverlag). DHZ, Vol. 2B, 2nd ed., p 689. Kuyumjian, R. M. (2008). Magmatic arc and associated gold, copper, silver, and barite deposits in the state of Goiás, central Brazil: characteristics and speculations. Brazilian Journal of Geology, 30(2). Leroux, M. V. & Ercit, T. S. (1992): Wagnerite, an accessory phase in cordierite-anthophyllite gneiss from Star Lake, Manitoba. Can. Mineral. 30, 1161-1165. M.H. Bromley, "Geology of the melange at Clarke Head, Cumberland County, Nova Scotia", B.Sc. Thesis, Acadia University, 1987. Tilley, Cecil E., 1957, Paragenesis of Anthophyllite and Hornblende from the Bancroft Area, Ontario, American Mineralogist, v 42, p. 412-416. Robert S. Penczak and Robert Mason (1997)Metamorposed Archean epithermal Au-As-Sb-Zn-(Hg) vein mineralization at the Campbell Mine, northeastern Ontario. Economic Geology and the Bulletin of the Society of Economic Geologists 92(6):696-719. Brand, Allison A., Groat, Lee A., Linnen, Robert L., Garland, Mary I., Btraks, Frederick W., and Giuliani, Gaston, 2009, Emerald Lake Mineralization Associated with the Mavis Lake Pegmatite Group, near Dryden, Ontario, Canadian Mineralogist, v 47, p. 315-336. McCormick, K.A. and McDonald, A. (1999) Chlorine-bearing amphiboles from the Fraser mine, Sudbury, Ontario, Canada: Description and crystal chemistry. Canadian Mineralogist, 37, 1385-1403. Franklin, J M, Schnieders, B R, Koopman, E R (1991) Mineral Deposits in the western Superior Province, Ontario (Field Trip 9) Geological Survey of Canada, Open File 2164; Satterly, J. (1977) A Catalogue of the Ontario Localities Represented by the Mineral Collection of the Royal Ontario Museum; Ontario Geological Survey Miscellaneous Paper MP70,464p. Rinne, M., & Hollings, P. (2013). The Characteristics and Origin of the Big Lake Mafic-Ultramafic-Hosted Volcanogenic Massive Sulfide Occurrence, Marathon, Ontario, Canada. Economic Geology, 108(4), 719-738. Anne P. Sabina, Rocks and Minerals for the Collector Miscellaneous Report 77, Geological Survey of Canada, 2003. Sabina, A.P. (2003) Rocks & Minerals for the collector; Kirkland Lake - Rouyn-Noranda - Val d'Or, Ontario & Quebec. GSC Misc. Report 77, 148 p.
Ulrych, J.: Antofylitový azbest z lateritizovaného serpentinitu od Křemže v jižních Čechách. 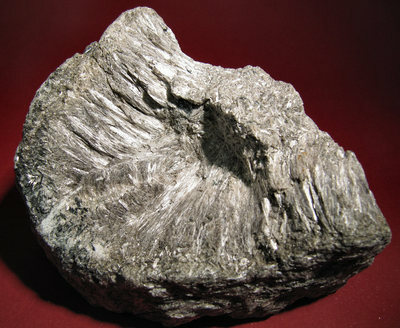 Časopis pro mineralogii a geologii, 1985, roč. 30, č. 3, s. 315-318. Welser, P.: Výskyty amfibolových azbestů v Křemžské kotlině. Minerál, 2007, roč. 15, č. 2, s. 120-123. Pauliš, P: Nejzajímavější mineralogická naleziště Moravy a Slezska. 1. vyd. Kutná Hora: Kuttna, 2001. Černý P., Černá I.: Pektolit a apofylit z Věžné. Časopis pro mineralogii a geologii, 1967, 12, 1, 45-48. Cerny, P., Novak, M., Chapman, R., & Masau, M. (2000). Subsolidus behavior of niobian rutile from Vezna, Czech Republic: A model for exsolutions in phases with Fe2+>> Fe3+. Journal of GEOsciences, 45(1-2), 21-35.; Cerny, P., Hawthorne, F. C., Laflamme, J. H. G., & Hinthorne, J. (1979). Stibiobetafite, a new member of the pyrochlore group from Vezna, Czechoslovakia. Canadian Mineralogist, 17, 583-588. Guotana, J., Morishita, T., Yamaguchi, R., Nishio, I., Tamura, A., Tani, K., ... & Pearson, D. (2018). Contrasting Textural and Chemical Signatures of Chromitites in the Mesoarchaean Ulamertoq Peridotite Body, Southern West Greenland. Geosciences, 8(9), 328. Mineralogical Magazine 1996 60 : 937-947; P. E. Champness and K. A. Rodgers (2000): The origin of iridescence in anthophyllite-gedrite from Simiuttat, Nuuk district, southern West Greenland. Mineralogical Magazine 64, 885-889. Harraz, H. Z.; Hamdy, M. M. 2010. Interstratified vermiculite-mica in the gneiss-metapelite-serpentinite rocks at Hafafit area, Southern Eastern Desert, Egypt: From metasomatism to weathering. Journal of African Earth Sciences, Volume 58, Issue 2, p. 305-320. Rocks & Min. : 22: 506-509. Geological Survey of Finland 2008.Ruostesuo -Zinc Database. Wilke, H.J. Mineralfundstellen in Skandinavien, (1979) Weise Verlag München, pag.318. Aumo, Raili 1982. Kartoitusraportti Kalvolan Nappikallion alueelta 3s. Outokummun aineistot 020_2113_2131_aumo_1982. Narayanan Kutty, T.R. and Anantha Iyer, G.V. (1977) Indian Journal of Earth Sciences, 4, #2, 141-159. Deb, M., Tiwary, A., and Palmer, M.R. (1997): Mineralium Deposita 32, 94-99.; Econ Geol (1980) 75:572-591; Mukherjee, A. D., Sen, R., & Mondal, A. (1998). Freibergite from polymetallic sulphide deposits of the Delhi-Aravalli belt, Rajasthan. Journal of the Geological Society of India, 52(5), 543-547. T. N. Muthuswami (1950) Sapphirine (Madura) — Proceedings of the Indian Academy of Sciences, Section A, 30, 6, 295-301. Dr. Kameki Kinoshita collection (curated at Geological Survey of Japan); Schoeman, P. (1996). Overview and comparison of Besshi-type deposits: ancient and recent (Doctoral dissertation, Rhodes University). Ohnuki (1966) Ganseki-Koubutsu-Koshogaku Zasshi, 56, 157-160.
ⓘ NW of Tsilaizina Mt. Lacroix, A. (1913) Minéralogie de La France et de ses colonies. Tome Cinq, Deuxième Supplément. Librairie Polytechnique, Paris 1913, p. 4. Cox, S.H. (1882) Art. XLVII - Notes on the Mineralogy of New Zealand. Transactions and Proceedings of the New Zealand Institute 1882, Vol. XV: 361-410 [Read before the Wellington Philosophical Society, 21 October, 1882]. Railton, G.L., Watters, W.A. (1990) Minerals of New Zealand, New Zealand Geological Survey Bulletin No. 104. ; Lauder, W.R. (1964) The geology of Pepin Island and part of the adjacent mainland. New Zealand Journal of Geology and Geophysics, 7:1, 205-241. Bugge, J.A.W. 1943: Geological and petrographical investigati¬ons in the Kongsberg-Bamle-Formation. Norges Geologiske Undersøkelse. 160, 150 pp. Johansen, D.W. (1981): Mineraler fra Drammenstraktene. In Halsen, O. : Turer i Drammenstraktene, 112-116. Drammen Geologiforening, Drammen. Taagvold, H. (2015): Verket kromgruve i Sunndal kommune, Møre og Romsdal. Stein. 42 (1), 4-6. Moore, A.C. (1977): The petrography and possible regional significance of the Hjelmkona ultramafic body (Sagvandite), Nordmøre, Norway. Norsk Geologisk Tidsskrift. 57, 55-64. Vokes, F.M. (1957): The Copper Deposits of the Birtavarre District, Troms, Northern Norway. Norges Geologiske Undersøkelse 199, 239p. Mitrofanov, F. P., Yakovlev, Y. N., Ikorsky, S. V., Yakovleva, A. K., Vetrin, V. R., Neradovsky, Y., ... & Rusanov, M. S. (1990). A Change in Composition of Rocks, Mineral Phases and Trapped Gases in The Kola Super-Deep Borehole (SD-3) Section of the Archean Complex with Depth. In Super-Deep Continental Drilling and Deep Geophysical Sounding (pp. 353-363). Springer, Berlin, Heidelberg. Wolter, H.U., Seifert, F. (1984): Mineralogy and genesis of cordierite-anthophyllite rocks from the sulfide deposit of Falun, Sweden. Lithos 17, 147–152. ; Schumacher, J.C., Schäfer, K. & Seifert, F. (1987): Lamellar nigerite in Zn-rich spinel from the Falun deposit, Sweden. Contribution to Mineralogy and Petrology. 95: 182-190; Gavelin, S. (1989). Genesis of the Falun sulphide ores, central Sweden. GFF, 111(3), 213-227.; Lasskogen, J. (2010). Volcanological and volcano-sedimentary facies stratigraphical interpretation of the Falun Cu-Zn-Pb-(Ag-Au) sulphide deposit, Bergslagen district, Sweden. MS Thesis; Kampmann, T. C., Stephens, M. B., & Weihed, P. (2016). 3D modelling and sheath folding at the Falun pyritic Zn-Pb-Cu-(Au-Ag) sulphide deposit and implications for exploration in a 1.9 Ga ore district, Fennoscandian Shield, Sweden. Mineralium Deposita, 51(5), 665-680. Natural History Museum, Stockholm collection ( item # 20000207); Jansson, N. F., Erismann, F., Lundstam, E., & Allen, R. L. (2013). Evolution of the paleoproterozoic volcanic-limestone-hydrothermal sediment succession and Zn-Pb-Ag and iron oxide deposits at Stollberg, Bergslagen Region, Sweden. Economic Geology, 108(2), 309-335. Magnusson, N.H. (1940) Herrängsfältet och dess malmer. Sveriges geologiska undersökning. Ser. Ca, Avhandlingar och uppsatser: 431. Årsbok 34 (1). 78p. Kjell Gatedal pers. commentary; Nysten, P. (1984): Kleinod des Nordens - Harstigen in Schweden. Magma 2/1984, 12-30. Trommsdorff, V., Evans, B.W. (1969) The stable association enstatite-forsterite-chlorite in amphibolite facies ultramafics of the Lepontine Alps. Schweizerische Mineralogische und Petrographische Mitteilungen, 49, 2, 325-332. Stalder, H. A., Wagner, A., Graeser, S. and Stuker, P. (1998): "Mineralienlexikon der Schweiz", Wepf (Basel), p. 229-230. U.S. Geological Survey, 2005, Mineral Resources Data System: U.S. Geological Survey, Reston, Virginia. ; Van Gosen, Bradley S. (2005) Reported historic asbestos mines, historic asbestos prospects, and natural asbestos occurrences in the eastern United States. USGS Open-File Report 2005-1189. Mineralogy of Alabama Geol Surv Ala. Bull120; Van Gosen, Bradley S. (2005) Reported historic asbestos mines, historic asbestos prospects, and natural asbestos occurrences in the eastern United States. USGS Open-File Report 2005-1189. Anthony, J.W., et al (1995), Mineralogy of Arizona, 3rd.ed. : 114; Cooper, J.R. & L.T. Silver (1964), Geology and ore deposits of the Dragoon quadrangle, Cochise Co., AZ, USGS PP 416. Anthony, J.W., et al (1995), Mineralogy of Arizona, 3rd.ed. : 114-115; Clark, M.D. (1979), Geology of the older Precambrian rocks of the Grand Canyon, Part III. Petrology of mafic schists and amphibolites, Precambrian Research: 8: 277-302. Stensrud, H.L. & S.W. More (1980), Precambrian geology and massive sulfide environments of the west-central Hualapai Mountains, Mohave County, Arizona – A preliminary report: AZ Geol. Soc. Igest: 12: 155-165; MRDS file #10098710. Anthony, J.W., et al (1995), Mineralogy of AZ, 3rd. ed. :115; Romslo, T.M. (1948), Antler Cu-Zn Dep., Mohave Co., AZ, US Bur. of Mines Report of Invest. 4214; Conway, C.M., et al (1990), USGS Bull. 1737: E9; Galbraith, F.W. & Brennan (1959), Mins. of AZ: 91. Anthony, J.W., et al (1995), Mineralogy of Arizona, 3rd. ed. : 115. Anthony, J.W., et al (1995), Mineralogy of Arizona, 3rd.ed. : 115. Galbraith, F.W. & D.J. Brennan (1959), Minerals of AZ: 91. Blasdale, Washington C. (1901), Contributions to the mineralogy of California University of California Department of Geological Sciences Bulletin: 2: 343; Pemberton, H. Earl (1983), Minerals of California; Van Nostrand Reinholt Press: 394. Hewett, Donnel Foster, Charles Wesley Chesterman & Bennie Wyatt Troxel (1961), Tephroite in California manganese deposits: Economic Geology: 56: 52-54; Pemberton, H. Earl (1983), Minerals of California; Van Nostrand Reinholt Press: 394.
ⓘ Gray Eagle prospect (Gray Eagle Discovery prospect; Gray Eagle claim) ? USGS (2005), Mineral Resources Data System (MRDS): U.S. Geological Survey, Reston, Virginia, loc. file ID #10033751. Sharp, W.E. (1959) Minerals from Los Angeles County, California. Printed privately, Los Angeles, California; Pemberton, H. Earl (1983), Minerals of California: 395. Bailey, Edgar H. (1941a), Mineralogy, petrology and geology of Santa Catalina Island, California: Unpublished Ph.D. dissertation, Stanford University: 44; Pemberton, H. Earl (1983), Minerals of California: 395. Bradley, W.W. (1940), Thirty-sixth report of the State Mineralogist: California Division Mines Report 36: 311; Murdoch, Joseph & Robert W. Webb (1966), Minerals of California, Centennial Volume (1866-1966): California Division Mines & Geology Bulletin 189: 160. Rice, S.J. (1957a) Asbestos. California Division of Mines and Geology Bulletin 176: 54; Pemberton, H. Earl (1983), Minerals of California; Van Nostrand Reinholt Press: 395. U.S. Bureau of Mines Open-File Report MLA 55-83 (1983); Buck Lake - 7 Chips Creek RARE 11 areas. ; USGS (2005), Mineral Resources Data System (MRDS): U.S. Geological Survey, Reston, Virginia, loc. file ID #10285655. U.S. Bureau of Mines Open-File Report MLA 55-83 (1983); Buck Lake - 7 Chips Creek RARE II areas; USGS (2005), Mineral Resources Data System (MRDS): U.S. Geological Survey, Reston, Virginia, loc. file ID #10188916. Murdoch, Joseph & Robert W. Webb (1966), Minerals of California, Centennial Volume (1866-1966): California Division Mines & Geology Bulletin 189: 65. Hanks, Henry Garber (1884), Fourth report of the State Mineralogist: California Mining Bureau. Report 4, 410 pp. (includes catalog of minerals of California pp. 63-410), and miscellaneous observations on mineral products): 67; Murdoch, Joseph & Robert W. Webb (1966), Minerals of California, Centennial Volume (1866-1966): California Division Mines & Geology Bulletin 189: 65. Sampson, Edward (1923), Asbestos: Mineral Resources U.S., 1920, part 2: 317; Lydon, Philip Andrew and O’Brien, J.C. (1974) Mines and mineral resources of Shasta County, California. California Division of Mines and Geology County Report 6, 154 pp. : 76; Pemberton, H. Earl (1983), Minerals of California; Van Nostrand Reinholt Press: 424. Wiebelt, F.J. and Smith M.C. (1959) A reconnaissance of asbestos deposits of the serpentine belt of northern California. U.S. Bureau of Mines Report of Investigation 7860, 52 pp. : 26; Lydon, Philip Andrew and O’Brien, J.C. (1974) Mines and mineral resources of Shasta County, California. California Division of Mines and Geology County Report 6, 154 pp. : 76; Pemberton, H. Earl (1983), Minerals of California; Van Nostrand Reinholt Press: 395. Wells, F.G. and Cater, F.W. (1950) Chromite deposits of Siskiyou County, California. California Division Mines Bulletin 134, part 1, chapter 2: 115; Pemberton, H. Earl (1983), Minerals of California; Van Nostrand Reinholt Press: 395. Laudermilk, Jerome Douglas & Alfred O. Woodford (1930), Soda-rich anthophyllite asbestos from Trinity County: American Mineralogist: 15: 259-262; O’Brien, J.C. (1965) Mines and mineral resources of Trinity County, California. Caifornia Division of Mines and Geology County Report 4: 125 pp. : 54. Laudermilk, Jerome Douglas & Alfred O. Woodford (1930), Soda-rich anthophyllite asbestos from Trinity County: American Mineralogist: 15: 259; Murdoch, Joseph & Robert W. Webb (1966), Minerals of California, Centennial Volume (1866-1966): California Division Mines & Geology Bulletin 189: 65. Januzzi, Ronald E. (1976), Mineral Localities of Connecticut and Southeastern New York State. The Mineralogical Press, Danbury, Connecticut. ; Van Gosen, Bradley S. (2005) Reported historic asbestos mines, historic asbestos prospects, and natural asbestos occurrences in the eastern United States. USGS Open-File Report 2005-1189. Lundgren, Lawrence, Jr. (1979), The Bedrock Geology of the Haddam Quadrangle. State Geological and Natural History Survey of Connecticut. Quadrangle Report 37. Davis, James W. (1901), The Minerals of Haddam, Conn. Mineral Collector: 8(4): 50-54, and 8(5): 65-70.; Lundgren, Lawrence, Jr. (1979), The Bedrock Geology of the Haddam Quadrangle. State Geological and Natural History Survey of Connecticut. Quadrangle Report No. 37: 9-13. Lundgren, Lawrence, Jr. (1979): THE BEDROCK GEOLOGY OF THE HADDAM QUADRANGLE. State Geological and Natural History Survey of Connecticut. Quadrangle Report No. 37, pages 9-13. Lundgren, Lawrence, Jr. (1979), THE BEDROCK GEOLOGY OF THE HADDAM QUADRANGLE. State Geological and Natural History Survey of Connecticut. Quadrangle Report No. 37. Rocks & Min. :64:185; Teague(1956); Van Gosen, Bradley S. (2005) Reported historic asbestos mines, historic asbestos prospects, and natural asbestos occurrences in the eastern United States. USGS Open-File Report 2005-1189. Minerals of Georgia: Their properties and occurrences. Robert Cook GGWRD Bull 92; Van Gosen, Bradley S. (2005) Reported historic asbestos mines, historic asbestos prospects, and natural asbestos occurrences in the eastern United States. USGS Open-File Report 2005-1189. Rocks & Min. : 64: 203. King & Foord, 1994. Mineralogy of Maine, Vol.1, p.29. Pearre, N. & A. V. Heyl (1960) Mineral deposits in serpentine rocks of the Piedmont Upland, Maryland, Pennsylvania and Delaware: U. S. Geological Survey: Bulletin 1082K: 707-833. Pearre, N. & A. V. Heyl (1960) Mineral deposits in serpentine rocks of the Piedmont Upland, Maryland, Pennsylvania and Delaware: U. S. Geological Survey: Bulletin 1082K: 772-773, 802, 804. Chute, Newton E. (1969). The Talc, Soapstone and Asbestos Deposits of Massachusetts (USGS Open File Report 69-39). The Minerals of New York City & Its Environs, New York Mineralogical Club Bull., Vol. 3, No. 1, Manchester, J.G. (1931): 30. The Minerals of New York City & Its Environs, New York Mineralogical Club Bull., Vol. 3, No. 1, Manchester, J.G. (1931): 68. Kimball, K & F. Spear (1984,) Metamorphic Petrology of the Jackson County Iron Formation, Wisconsin, Canadian Mineralogist: 22: 605-619. Olson, Maile and R. Lodge (2016) Ore petrography and precious metals of the primary Flambeau Mine sulfide ore: Abstract: Institue on Lake Superior Geology, Program and Abstracts, vol. 62, p. 113. A. C. Skerl, F. A. Bannister and A. W. Groves (1934): Lusakite, a Cobalt-Bearing Silicate from Northern Rhodesia. Mineralogical Magazine 23, 598-606. Bahnemann, K.P. & Lockett, N.H. 1979. The geology and copper mineralization of the Gwai River Mine area, Wankie District, Rhodesia. Spec. Publ. geol. Soc. S. Afr., 5, 209-217.